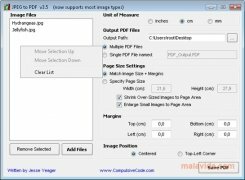 JPEG to PDF is a useful application with which you will be able to convert images in JPEG format to PDF in a quick and simple way. 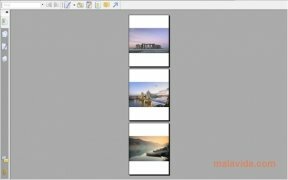 If you need your images to be PDF files so that they can't be modified easily, this is the perfect tool. Images can be handled by means of image editors. With JPEG to PDF you'll be able to make sure that they can't be modified and that they are in a format that maintains all the image quality, like PDF. One of the advantages of JPEG to PDF is that it doesn't require installation and that it is very easy to use. To start off you have to add the images that you want to convert. 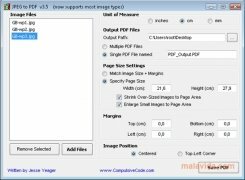 JPEG to PDF supports several image formats: JPEG, JP2, J2K, PNG, GIF, BMP, TIF, EMF and WMF. After that you can choose the size of the pages and the margins that the image will have and the end of the document. You can also configure if the image will be placed centered or in the top left corner. After that all you have to do is click on Save PDF and JPEG to PDF will convert the images. 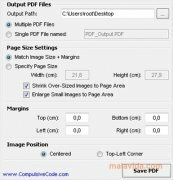 JPEG to PDF will also allow you to create a unique PDF file with all the images or a PDF for each image. If you need to send many photos by email, a good option is to send all of them as a unique PDF. To do so, download JPEG to PDF for free.